CBD oil dosages – How much should you take? Free UK Delivery on orders over £30, or £3.95 if under £30. 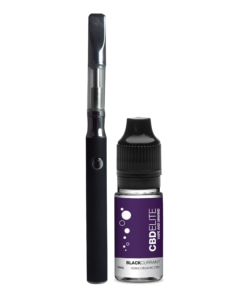 This CBD e-liquid e-cigarette starter kit is perfect for those just getting into using CBD e-liquid for the first time. The simple e-cigarette has an easy to fill mechanism which you can fill with any e-liquid of your choice. You can dilute the e-liquid to give it the taste that you require and of course, all CBD Twist e-liquids are compatible with all e-cigarette devices. You can choose any flavour to go with your new starter kit from CBD Twist. Not sure which one to choose? Why not check out our full range of CBD e-liquid. Vegetable Glycerin, Propylene Glycol, Natural Flavour, 100mg of Organic Cannabidiol food additive. No THC content. I’ve never done this before. This kit was really helpful to get me started and to help relieve my pain. It was easy to use and was enjoyable to use as a first timer. Sign up for the latest discounts & deals! CBD Twist is trading name of Fog Mansion Ltd. The products can ONLY be sold as food supplement and not claim to cure, heal or diagnose any health issues.